CINCINNATI, OH (WOIO) - A family pet is in critical condition, after trying to save his owner from a house fire near Cincinnati. The fire claimed the life of a 33-year-old man, and now his pet boxer Carmen is fighting for her life. Carmen is getting better, but she's not out of the woods yet. 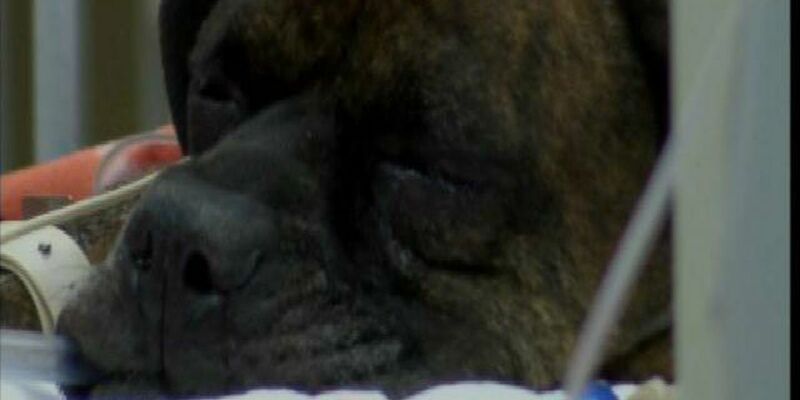 When a fire broke out at a Clermont County home, neighbors found Carmen in the basement covering her owner's face as the flames surrounded them. The man she was trying to save, 33-year-old Benjamin Ledford, did not make it. Carmen was unconscious but was resuscitated and brought to an Emergency Pet Care Center. "She was very red around the gums and the eyes which is consistent with smoke inhalation, damage from the heat and the chemicals," said veterinarian Dr. Marlo Anderson. Carmen's condition worsened in the first 24 hours after the fire. She was kept in an oxygen filled kennel. Now she is hooked up to a ventilator that is breathing for her. Carmen is sedated so she doesn't pull her tubes out. But Dr. Anderson says Carmen is finally improving, but vets say pneumonia is a concern. "She is definitely still considered very critical but she is certainly in better condition than she was before we placed her on the ventilator,"
The brave dog is still in severe pain, and struggles for every breath as her lungs recover. Carmen is getting medication and fluids through an IV, and is certainly aware of all those around her, pulling for her recovery. "Her body is more focused on breathing right now. So we are providing her with the fluids to stay hydrated and at this stage it may be a day or two before she is interested in eating. Her body is focusing on other things right now," said Dr. Anderson.